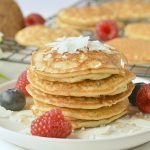 Low carb coconut flour pancakes, healthy easy fluffy keto pancakes, 100 % grain free + dairy free. 1 1/2 teaspoon guar gum - not optional ! In a blender, add all the ingredients, order doesn't matter so feel free to add the ingredients in any order. Blend on high speed for 30 seconds. Stop, scrape down the side and bottom of the blender - sometimes some coconut flour stick to the bottom. Blend again for 15 seconds. Transfer the pancake batter into a medium bowl. Set aside 10 minutes to let the coconut flour fiber activate. The batter will slightly thicken. Warm a non stick crepe maker or non stick pancake griddle until hot or as you will do for regular pancakes. Make sure you warm on low heat-medium heat to avoid burning the pancakes. Slightly grease the griddle using a piece of absorbent paper covered with 1/2 teaspoon of coconut oil or vegetable oil. Scoop 1 tablespoon of batter, this will make one pancake. Repeat leaving 1 thumb space between each pancakes as they will expand slightly on the hot griddle. Cook for 2-3 minute on one side, you know it is cooked when the sides starts to set and the center of the pancakes dry out. Be careful, the border must be set before flipping over or they will be too fragile and break. Slide a kitchen spatula under the pancake, flip over and cook for an extra 30 -45 seconds. Store on a rack until all the pancake batter has been cooked. This recipe makes about 12 small pancakes. Store in the fridge in an airtight container and rewarm on the griddle the next day. You can also rewarm pancakes into the toaster. Freeze into reusable eco silicon bags and defrost 30 minutes before breakfast. Rewarm as suggested above.